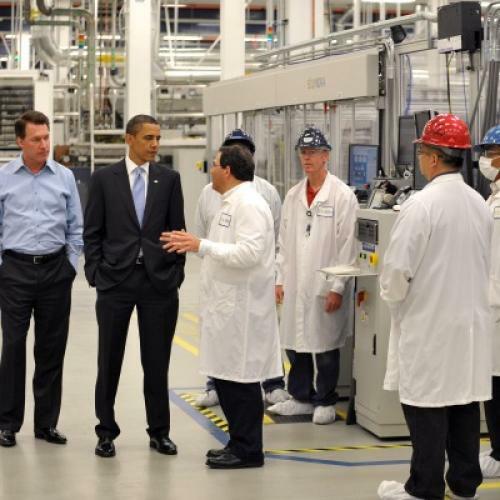 Is asking voters to compare Romney’s vulture capitalism to Solyndra a good idea? The Romney campaign and its cohorts seem to think so. Within the past few days, American Crossroads, Karl Rove’s super PAC, released an ad that counters Obama’s attacks on Bain by highlighting Solyndra, a bankrupt solar panel company that had been given a government-backed loan guarantee, as well as the auto industry bailout. George Will made the Bain-Solyndra comparison on This Week; Paul Ryan did the same on Fox News Sunday; Michael Barone piled on in National Review Online. It’s not the smartest response in the world. First off, Romney allies typically explain away Bain’s failures as just the way capitalism works—sometimes, bad companies are swallowed by the market. Solyndra, whose solar technology was priced out of the market by cheaper Chinese solar panels, is a pretty classic example of this, and by citing its Adam Smithian demise in response to attacks on Bain, Romney allies have diminished their ability to dismiss Bain’s loser companies as just the natural cycle of capitalism. But the larger risk of this approach is that comparing any of Bain’s failures to Solyndra asks voters to examine private equity alongside public stimulus. The former is a game in which a tiny group of stakeholders set out to create as much value as possible for themselves: buying companies, often loading them up with debt they can’t bear, and extracting exorbitant fees for themselves before they reintroduce the company to the public and it either fails or succeeds. It’s essentially a no-risk racket, one Timothy Noah describes in fuller detail here. Then there’s government stimulus, which is aimed at benefitting the public, and which the Obama administration has distributed with considerable success. Take the Department of Energy loan guarantee program through which the administration backed Solyndra. That program has been hugely effective for shoring up projects that the private market underinvested in. A recent, independent audit (pdf) by the former national finance chairman for John McCain found that it was due to come in about $2 billion under budget, and had subsidized mainly low-risk, critical electricity projects. The American Crossroads ad goes a step further and offers, as a comparison with Bain Capital’s failures, the government’s auto bailout, which an independent group found saved 1.45 million jobs, when no private equity dollars could be found to do the same. On balance, the White House seems to be playing Wall Street games—if that’s what you want to call massive investment in underfunded public infrastructure—pretty decently, and in a manner that produces more value for the public than private equity firms. Bain and Solyndra are really nothing alike. And by insisting that they are, Romney boosters have given Obama’s campaign an opening to brag about what American Crossroads is calling Obama’s public equity presidency—and all its successes.